Taking the fondest memories of loved ones and memorializing them forever for our families is one of the greatest rewards in our business. Though it can be emotional for our survivors, the very process of compiling favorite photos and videos and sharing stories and accomplishments is at the same time quite powerful and restorative in itself, and as such serves as the foundation of the healing process. We are honored to be entrusted with these memories and take great pride in offering a number of tribute options to do them justice. Memorialize your loved one’s life’s journey with a professionally-produced video crafted from photographs and important documents hand selected by family and friends. Honor your loved one with an online obituary page that reflects key milestones and achievements in their life, complete with pictures and video. This digital memorial page remains up forever. 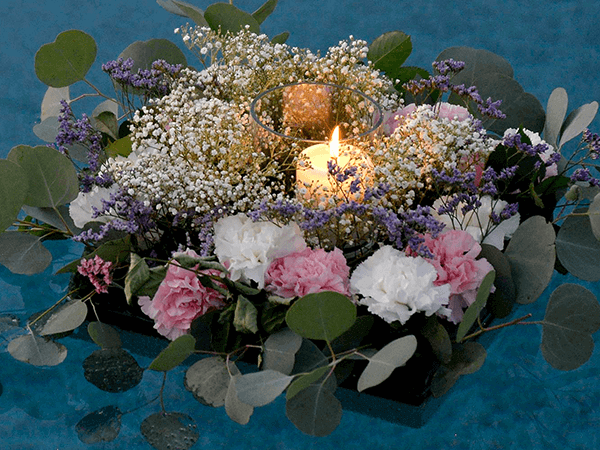 Unique, handcrafted, custom candles created from the flowers delivered in your loved one’s honor to the funeral or memorial services. A lasting tribute to the beauty of life and your loved one’s eternal impact in yours. What better way to keep your loved one’s memories near and dear than with custom jewelry personalized with dates, special quotes, nicknames, or any special inscription or engraving your prefer. Available as memorial keepsakes and also as permanent cremation ash holders.